India, home to vivid and beautiful scripts is one of the most ideal environments to study and practice type design. There has been a rich heritage of manuscripts, calligraphy, letterpress and other aspects of letter design. The hand-painted tradition that still vibrantly lives on in many a parts of the country is an institution in itself. After the advent of digital fonts however one ceases to see the same burst of freshness and variety that these anonymous hands create nationwide. One of the fundamental reasons for the condition of type design in Indian scripts is rooted in the design education prevalent in most institutions across the country. Most institutions, at both the undergraduate and post graduate levels, do not give enough stress to designing with Indian scripts or using Indian typography. The basics of typography are taught in the context of Latin type design. The predominance of Latin typography over Indian scripts in classroom exercises is rampant. The research undertaken, aims at designing an organized approach to teaching type design in Indian scripts. It attempts to suggest models that can be adapted to cultivate shared learning spaces, build archives and physical and virtual reference libraries. 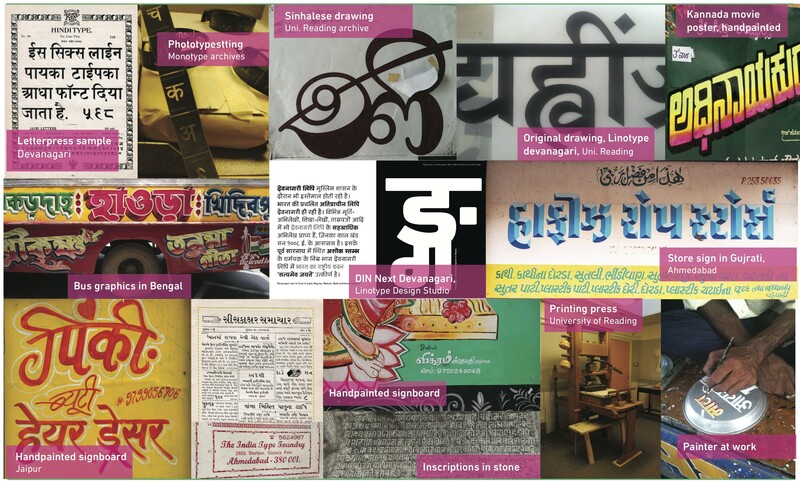 It encourages greater exposure to Indian scripts and typography to design students. The research aims to identify foundries, lettering artists who silently exist in many parts of the country; to try channelize the efforts of many type enthusiasts scattered in different places. The main aim is understand how to ensure inclusion of Indian scripts in existing design syllabi more extensively. Also propose a course on Typeface design focussing on Indian scripts. The attempt is to try and identify a framework for typeface design education in India for Indian scripts. The output of the research shall be a system design to foster a wholesome learning environment for Indian scripts.